RUSH: Here’s Robin in Highland, California. Great to have you. Really glad you waited. I appreciate your patience. How are you? CALLER: I’m doing great. It’s really good to talk to you, and you are my savior every day to make me in a happy mood. RUSH: Well, thank you. I’m glad I’m able to do that. CALLER: (chuckles) Yes, you do. You are what helps me get through the day. I was so upset yesterday with this whole thing, and last night I was just livid. But when I first heard, like, CNN bashing them, saying, “Oh, this is the president we’ve been waiting for,” it just… I thought, “Oh, my gosh. I hope they aren’t playing this on him because he’s so desperate for everybody to like him,” and if he only knows that they’ll never like him… No matter what he does, they will not like him. RUSH: I have… I’ve told him that. CALLER: I just hope he doesn’t cave. RUSH: Robin, I’ve told him that on two separate occasions. But like everybody else that talks to him, I don’t know if he heard me. CALLER: Oh. Gosh, I hope he does. RUSH: I don’t know if he was listening. I mean, he was looking right at me when I said it, but I don’t know if it registered. CALLER: Oh, I just… I worry about that. I really do. RUSH: But what about Dana Bash? We’ve got the sound bite. Do you really think she means that? “This is the president we’ve been looking for; this is the president we were hoping for”? Do you think she even means that? RUSH: Well, the reason I think she might have said it is ’cause this is what they have been trying to force him to become with all the criticism and all the pressure. They want… To her, you know, if she watched that and saw Donald Trump totally caving and abandoning what got him elected, to her, that’s a major, manger success, and, “This is the president we were looking for,” because as far as Dana Bash is concerned, I guarantee you, what she saw was Trump giving away the store to the Democrats yesterday. RUSH: That’s what had you upset, right? CALLER: Yes. Oh, very upset. Yes. CALLER: Like I said, you’ve talked me down, because you… This is what I can’t wait for your show every day to hear. I haven’t been listening that long. I started listening to you right before the election, and you were my lifesaver because I cannot watch the news. I can’t even watch my local news anymore because it’s awful. RUSH: Oh, I can’t, either. I can’t, either. RUSH: I hear you on that. Oh, my God, absolutely. Not even the weather forecast is legitimate. CALLER: (laughing) That’s about it. That’s what we watch it for. RUSH: Every weather forecast is, “Climate is destroying us!” Yeah. CALLER: Oh, it’s awful. (laughing) But thank you so much, Rush. Like I said, you are my pick-me-up every day. You put everything in a different perspective, and I need that. I really do. 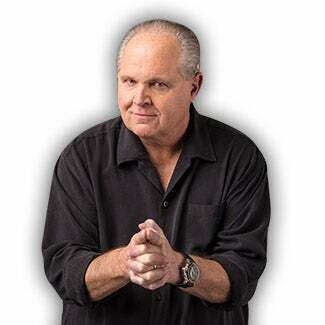 RUSH: — right before the cabinet meeting and his take on what happened yesterday. Do you get the impression…? Let me not lead you. 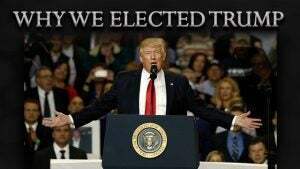 RUSH: What did you think when you heard the president’s remarks, the review of his meeting yesterday? CALLER: No, I loved it, because he’s not harping on that. He’s not on that. I get that… The more I thought about it this morning, like I said, listening to you and listening, you know, just reading other things, I’m like, “Okay. This is not what he’s doing. He was not caving yesterday.” And boy, was I worried. I was very worried that he was caving on us. And this is the thing that got him elected over everything else — over the economy, I believe, over everything — was this immigration thing. And I just would be petrified if he caved. I mean, he would lose me, and I’m a very big supporter of his. RUSH: Right, and you know, I have to think that he knows that. He’s not stupid by any stretch. Robin, thank you very much. I sincerely appreciate your thoughts and the fact that you’re in the audience and that you found us, and feel free to call any time. Moving on to Rob in Omaha. You’re next, sir. Hi. CALLER: Hey, this is great. It’s almost like a late Christmas. CALLER: Yeah. Real quick. I know you got a lot of people on hold. My take on it was it reminded me of The Apprentice. He set everybody down and basically said, “This is what you’re gonna do.” In this case, of course, it’s the immigration reform. I thought it was kind of funny when they came kept pressing, “Do you want us to do this or would you do this?” And he’s like, “No. I’m gonna own it.” I think he’s kind of putting it back on not just the Republicans and the Democrats, ’cause everybody knows what got him elected. And he’s not gonna change that. I don’t think he has to go back and repeat it. I guess when he said that he would sign whatever, it the kind of… The first thing I thought was, “Man, I don’t know if I like that.” And then I thought, “You know, it’s almost like he’s taking the training wheels off, saying, “We’ve been talking about it. We know it’s midterm elections. You know what my base is. You know what got me elected. You know what I’m about. I can own whatever you send to me, but the question is: Can you? You know, if you have something that’s not gonna appeal to the Republican base, then that’s on you.” I don’t know if he would have done this six months ago because that was before I think the Republicans really got a taste for victory like they did with the tax reform. RUSH: Look. Let me… Rob, I’ve gotta… I’m running out of time. I have to take a break. But I’m gathering that you think that this was like The Apprentice yesterday. I never watched it. I’ve never seen an episode of The Apprentice, and… (interruption) Well, those who have seen it are agreeing with that. So there you go! It was The Apprentice, Rob thinks. RUSH: Gloria in Gig Harbor, Washington, as we stay with the phones. How are you? CALLER: Thank you for taking my call. I’ll get right to the point. I want to comment on his leadership, which seems to be under fire. I heard him… I mean, I heard on the radio. He has a meeting, he invited the legislators, and he asked them what they wanted in this DACA thing or this immigration issue. And he told them that one thing that he was gonna have was the wall. Because he’s the president, and the role of the president is national security, and that’s what the wall is about. The president is over the military and over foreign affairs, and this wall will help keep us safe. Everything else, the DACA, that’s up to the legislators. That’s their job, and he honored them by giving them their job to do. CALLER: Instead of usurping it all and deciding everything, he gave them their job to do. And they should rejoice and get to work and do it. RUSH: He’s such a great guy. He just wants the wall and they can do anything else ’cause he’s being totally deferential to these brilliant people in the Senate and the House, and he was exhibiting leadership. He was not domineering; he was not dominating; he was not telling them what to do. They can do whatever they want; he’ll sign it, as long as there’s a wall in it. (laughing) This was… (laughing) I love doing this. The takes that people have on this fascinate me, folks. As you know, I’m fascinated by people who think and the way they think. I don’t care what it is. Thinking doesn’t happen much anymore, and that’s why I am so receptive to hearing it. I appreciate that, Gloria. Thank you very much. We have time to squeeze… Nah, let’s not. I’m making myself time constraints on the other side, so here’s a break and we’ll be back. Don’t go away. RUSH: Thave been people calling and they’re on hold who want to weigh in on this, meaning the Trump meeting yesterday, and what it means. One little ditty here from TheHill.com: “Democrats Skeptical of DACA Deal Framework — Democratic leaders are facing swift pushback over the parameters of a potential immigration deal hours after President Trump and lawmakers appeared to agree on the broad framework. “Some Democratic lawmakers are pushing back on including changes to ‘chain migration,’ which allows citizens and permanent residents to sponsor family members.” We know what it is, and it’s gotta end. Now, TheHill.com here and the rest of the Drive-Bys, they’re always trying to make chain migration sound so innocuous. It isn’t. It’s the primary thing after illegal immigration, border crossing itself, that’s got to be stopped. It’s what allows green card holders to sponsor family members. Anyway, the point is, Democrats skeptical of DACA deal framework. So you had people in there thinking that Trump agreed to a deal with DACA. Feinstein’s, “Let’s have a clean DACA bill.” “I could go with that.” I’m telling you, there was nothing concrete agreed to yesterday. That meeting — do not doubt me — that meeting was not about anything concrete, binding or otherwise, on immigration. Here is Anna in Raleigh, North Carolina. Great to have you with us. How are you? CALLER: Oh, I’m great, Mr. Limbaugh. It is a true pleasure and honor to speak with you today. Thank you so much. RUSH: You bet. My pleasure. CALLER: I wanted to say also, Robin mentioned this earlier, but I wanted to thank you for keeping us enlightened and focused. Last year before the election, I listened every day to get my hopes up and to stay positive. RUSH: I’m just gonna tell you, I don’t think that there is anybody in media who understands Trump better or even as I do. CALLER: I think you’re right. RUSH: I don’t think there’s any question. CALLER: You’re right, sir. But I wanted to comment that the president — and I’m 120% behind him. I’m an avid supporter. He did sound very much like The Apprentice yesterday. And that, sir, for me would be if he does not do, regarding immigration, as he campaigned on, that would be the one deal breaker for me. RUSH: He’s gotta know that. Don’t doubt that he knows that. CALLER: The reason, I’m very passionate about immigration. I’m a naturalized citizen. I came here as a child from Cuba with my parents. They lost everything. My father had a business, it was taken away, all of their worldly possessions were left behind. They came with nothing but had so much respect and regard for this country. RUSH: And you followed the rules. CALLER: That’s right, sir. That’s my point. My parents absolutely wanted to do the right thing and go through the channels, the paperwork. It took years. But they did that. We became citizens. I love this country beyond measure, and it’s really difficult to see what’s been happening lately, especially, as I say, with immigration. That’s very near and dear to me. RUSH: Well, what’s happening is the Democrat Party is seeking future voters. It’s no more complicated than that. It’s no more complicated than the Democrat Party requires, if they are to win and stay in power, they need a permanent underclass. Folks, stop and think about that for just a second. Now, I know that some of you in the audience are liberal Democrats and you’re listening here for whatever reasons, and I know when you hear me say that, you think that I’m just trying to draw attention, that I may be saying something I think is a little extreme just to say it. I want to assure you here that I am not exaggerating at all and I’m not trying to be provocative with that. I’m trying — well, I am being honest, and I’m trying to persuade people that that is who or what the Democrat Party is. Just stop and think of it for a moment. We have a political party that essentially seeks, desires, needs people essentially in poverty in order to remain in power. Now, how does a party like that that structures its existence that way, that seeks to maintain power that way, how does a party like that create economic growth, how does a party like that stand behind the concepts of individual liberty and freedom? A party that is threatened by self-reliance, a party that’s future and power base is threatened by people being upwardly mobile and no longer needing as much government. Stop and think about it. How in the world can that be advisable? How can that be desirable? How can that be helpful? I mean, even if you think that those people are the most compassionate and the most understanding and they’re fair and they don’t discriminate against gays and lesbians and transgenders and whatever else the social justice warriors care about, throw all that stuff out. What in the world is it about a party that recommends itself which needs a permanent underclass in order to win elections and stay in power. And, in order to get that underclass, will do what they can to stymie economic growth, like demanding an increase in the minimum wage, which causes job loss. High unemployment is a favorable circumstance for the Democrat Party. People unable to access health insurance and health care is good policy-wise for the Democrat Party. A party that is willing to subvert existing law and allow open borders so that the poor of the world can come here unchallenged and be taken care of by Democrats so that they will be assured to register and vote Democrat, what does it mean for the rest of the country if that is the primary objective of the Democrat Party? I know some of you are saying, “Wait a minute, Rush. There’s a lot of rich people in –” Yeah, yeah, yeah, that’s true. And the Democrats take care of their rich. They take care of ’em really well. And they make sure that their rich never have to interact with any of these illegal immigrants. Democrat elites don’t live where these people end up living. I think it’s hideous. I think it’s insidious that we have a political party that defines, that needs, for its power and success, a constant group, growing group of people essentially in poverty. RUSH: Here is Joe in Albuquerque, New Mexico. Great to have you, Joe. How are you doing? CALLER: Excellent, Rush. This is so cool! Thanks. I have a point that I would like to make. My buddy Tom and I get together every Saturday morning to do our sculpting session for three hours and we talk politics. And, I’ll tell you what. One of the things that we agree on… We both listen to you through the week. CALLER: But my observation — our observation — is that even if you don’t really understand what President Trump is doing, he knows what he’s doing. It just seems like that’s what it always amounts to based on the success that he’s had. RUSH: Okay. I understand what you’re saying. Because the bottom line is you watch Trump, and if it doesn’t make any sense, eventually it does. Right? RUSH: That’s what you’re saying. RUSH: That’s true. I think that’s a pretty good observation. A lot of people have trouble with it because they’re plugging Trump into an existing model or, you know, “holes” is the saying. Square peg, round hole and so forth. But they’re plugging him into the wrong system. They’re trying to take Trump as who he is and plug him into their system, and of course it’s never gonna work when they do that. They’re never gonna understand it — and, of course, they’re not patient enough to wait. But if you look at the things have happened since Trump has been president, in just one year look at the massive improvements over the Obama eight years. And yet there are still people who say Trump doesn’t know what he’s doing. The truth on the ground is he obviously knows what he’s doing. He couldn’t be where he is if he didn’t know what he was doing! CALLER: Exactly. I’d be willing to bet that within a very short period of time, we’re gonna understand exactly what he wants us to know about what went on in that meeting. RUSH: Probably. That’s your theory, that eventually all will become clear. RUSH: What do you and your buddy sculpt? CALLER: I have actually done Ronald Reagan and Lincoln. He’s more in the (unintelligible). RUSH: Oh, you do busts? CALLER: Oh, yeah, exactly. Exactly. RUSH: Well, you know, some sculptors do different things. I just wanted to get an idea what you guys are sculpting. CALLER: That’s my fun time of the week. So we do art and we talk politics and we kind of see eye-to-eye, especially because we listen to you throughout the week and we get to discuss what you talk about during the week. RUSH: Yes, of course. Right, it’s the glue. RUSH: It’s the glue. It provides you the consistency with which to sculpt and discuss at the same time. RUSH: No, it actually is a good observation. That’s a good way of putting it. Even some of Trump’s supporters, they watch and it doesn’t make any sense. But at some point, it does. It works out. It ends up working as you hoped it would or thought it would. Even that, you might say (chuckling), “I don’t know how he got there. But he did.” And I think that’s part of the… Everybody thinks of Trump as this egomaniacal, attention-demanding narcissist. And you say, “What? You had a full hour meeting on immigration and your reaction to it is that?” And then at the very end of it, like he always did… During the campaign, I told everybody every day: If you listen carefully — it may go by in 30 seconds or a minute, but — you get the genuinely sincere Donald Trump where he thanks the people in that audience and lets them know he deeply appreciates their showing up and that he considers it an honor for them to be there. In every Trump public appearance, you get that somewhere in the middle of it or at the end. You’re gonna get 30 seconds or a minute. In today’s case, we got a minute of Trump running on about how great a meeting it was and how the media was congratulating him, sent two congratulatory notes on how media needs him, they’ll never want anybody else to beat him ’cause the media needs him for his ratings. And then the last 20 seconds of that meeting, before he kicked the cameras out — this is today, not yesterday — he spelled out what his immigration requirements are. And they were everything they’ve always been: a wall, an end to chain migration, and an end to this visa lottery and overall border security, and something to do with the DACA kids. And it took maybe 20 seconds for him to mention it. It was at the very end after he’d had yuk yuks and fun. And to the people watching who saw it, they were reassured and were told by virtue of that, that whatever happened in that meeting yesterday was not what they should have paid attention to, but what he said in the last 30 seconds of the thing today. The last 30 seconds of his public speaking before he went to the private cabinet meeting today was where he told everybody what his immigration plans are, and they haven’t changed. They were exactly what he stated they were during the campaign. And he stated it as though that’s what was established in the meeting yesterday. Of course, everybody watching it says, “No, that was not established. You appeared to get rolled yesterday.” But he didn’t. So this narcissism and this demand to be adored and revered and all that, there’s a part of me that thinks a lot of that is technique that is designed to distract people while he’s actually doing an end run trying to get done what he wants to get done. I don’t care if he’s negotiating to build a building or prices for pipes in the new building or what have you, but I do know that the vast majority of people in Washington don’t have a prayer in understanding it.